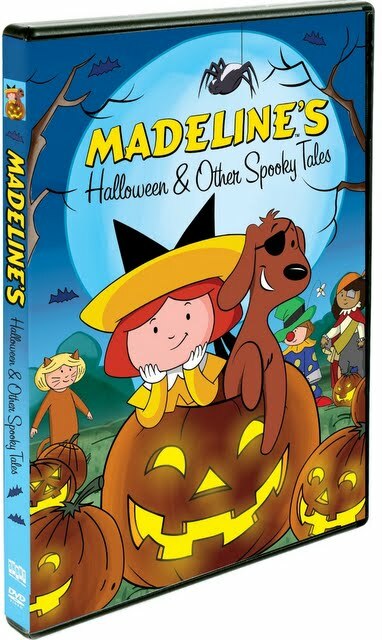 Instead of the usual twelve girls walking in two straight lines, the first two episodes contained in Madeline's Halloween & Other Spooky Tales finds the young Parisian redhead and her friends touring New York City as part of twenty-four girls wandering the streets in four straight lines. Arriving in America just in time to learn about Halloween at the invitation of their overseas pen pals, the characters in the adorable animated series inspired by Ludwig Bemelmans' cherished collection of classic children's books are fortunate enough to discover new topics of fascination from jazz to radio shows in this delightful DVD. Yet New York City is just one of several exotic locations visited by Miss Clavel, Madeline and Pepito, the son of the Spanish ambassador who lives next door to the girls in Paris in this superior compilation of five episodes from TV's The New Adventures of Madeline that easily surpasses the previous releases from Shout! Factory over the past several months. Obviously, given the title, the unifying theme of Shout's disc is overcoming fears – whether it's in the form of Pepito's three bullying cousins, mummies or the unknown – by way of knowledge, sensitivity and understanding to tie in perfectly with the upcoming Halloween holiday. However, a majority of the selected stories could also have been packaged under the heading of “Madeline's Travels” as the gorgeous animation and research heavy fact-filled dialogue by Miss Clavel and other authority figures educate viewers about Spain as well as Egypt via engaging vacations. In addition to serving up lots of back-to-school style statistics, creativity rules the day as evidenced in a nod to Orson Welles' famous radio show broadcast of The War of the Worlds when the girls create a frightening tall tale that accidentally plays over the airwaves as if it were a special breaking news report to New York City residents. And in spite of Halloween and things that go bump in the night being the one constant link throughout, the five episodes continually reinforce strong values of honesty and friendship as Clavel's crew does their best to rid a young American Shirley Temple-like child actress of her homesickness on their Parisian soil. Complete with Christopher Plummer's wonderful narration and some catchy songs as well as the opportunity to jump to whatever episode your child prefers or play them altogether as a feature length work, there's much to enjoy in the approximately 110 minute presentation that doubles as a great introduction to the world of Madeline.